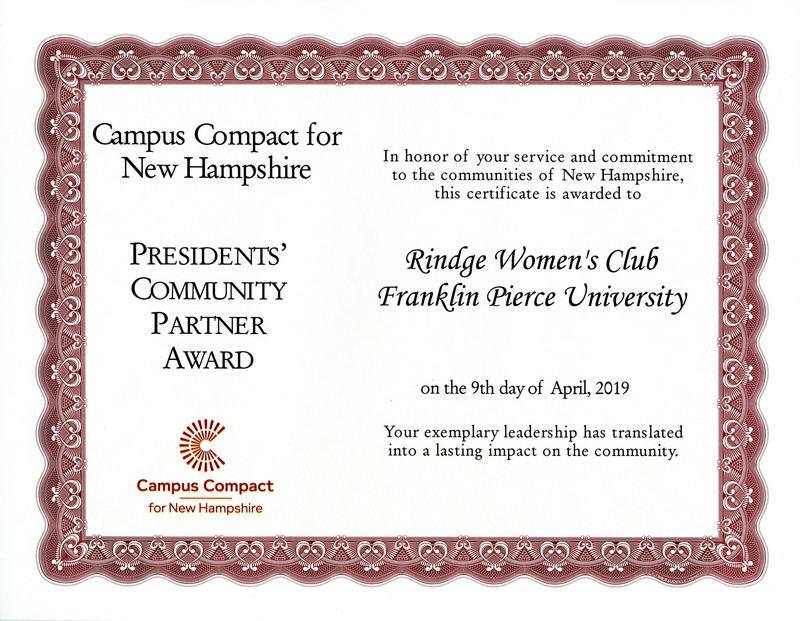 Franklin Pierce awarded the 2019 Community Partnership Award to the Rindge Woman's Club. Thank you, FPU. We enjoy working with you to benefit the community. The Chamber of Commerce will be at the Transfer Station passing out Blue Bags for roadside trash collection. Bags will also be available at the library, post office, town office, TD Bank, the Meeting House, and the Recreation Department. The Rindge Woman's Club will oversee the Blue Bag collection at the Transfer Station. Each full bag will receive one raffle coupon. Two $50 gift certificates will be raffled, one for an adult and one for a child (adult must be present).